Something I've been thinking about for a while. This is a scene (or set of them) from the book I'm currently working on. I've been doing some scripting and panel sketches along with the writing, with the intention of completing a comic edition along with the prose. Chloe and friends are making cookies for a school dance tomorrow night--they're making cookies tonight--and a lot of noise, and I've just been sitting in the dining room drawing these panels in Art Rage on the iPad. 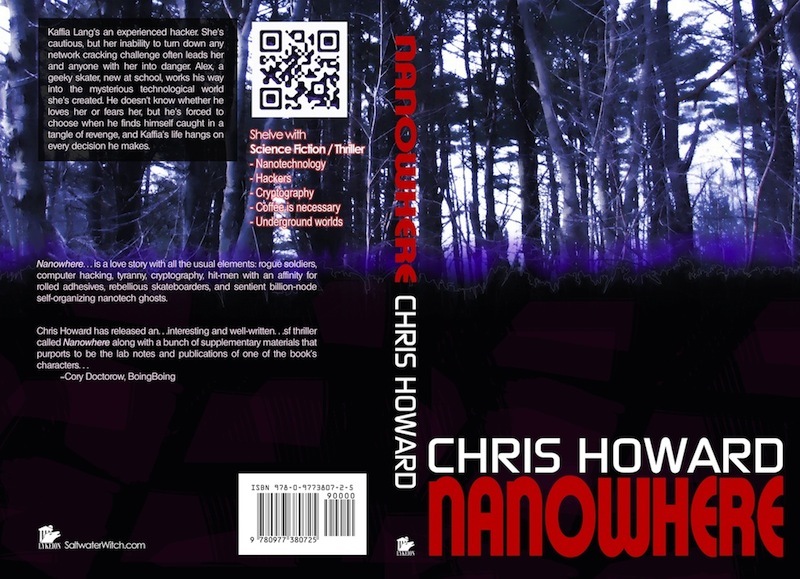 The second edition of my tech thriller Nanowhere is out, although the official release--in print--won't be until next month or early 2012. The ebook's available right now at Amazon and B&N on the Kindle, Fire, Nook, and any device with the Kindle or nook apps. (More eBook formats and channels to follow). This edition has a bunch of edits over the original version, which came out in 2005, and includes two of the research reports by the character John Andreden at the back of the book. The eBook cover is on the left and the print book is below. Okay, got some time over lunch to paint, and moved this one forward quite a bit. Nearly done. Low-orbit jump team rolling into combat or some kind of action on the surface below. I did some painting tonight--still in progress. Soldiers jumping out of some kind of suborbital military craft, geared up for re-entry. Painter, Art Rage and PS, about two hours work, still a ways to go. Here's another peek into one of the things I'm working on--another one drawn and painted on the iPad, mostly in Brushes, but also SketchBook Pro and even a little bit of Art Studio. The story is SF, near future. This is the opening page, and she's my POV character. Okay, here's the last character study for a bit, finished up last night with the gun-toting character on the left. I'm doing these as studies for a project I'm going to jump on in a week or so, hoping to finish up around the beginning of the new year. And again, all drawing, painting, adjusting, were done on the iPad, mostly in the Brushes app. Seriously thinking about sticking with that for this project, too--I know, I've said it before, but this time...I may just mean it! Took a couple hours last night to sketch and paint this out on the iPad. Here's a character study for a project I'm about to start, two of the main characters--art below and video showing progress below that. The video shows how I color and shade in the Brushes app on the iPad. I usually use Sketchbook Pro to do the rough sketch, bring it into Brushes to refine, color, shade, outline. I usually finish up in Sketchbook Pro--also using some filtering tools to adjust overall lighting, tinting, contrast. To finish up, I brought the image into the Filterstorm app, dropped the contrast way down, and darkened it up, also brought the warmth and sat up.